Today in America TV is proud to present a series dedicated to economic development leaders – the heroes and heroines of putting cities on the map. Economic development leaders are the new heroes and heroines today. What makes one city or town more well-known than others? Why do you hear more about one place than another? Today in America with Terry Bradshaw features an economic development series that is dedicated to those who lead in the industry of making their cities and towns known throughout the world and in spite of those who do not like change. These dedicated professionals work with the community and policymakers to promote the standard of living in the area and raise awareness in hopes of luring new business to the city. The television program is hosted by one of the country’s most recognized sports celebrities. Terry Bradshaw is a former Pittsburgh Steelers quarterback and National Football League Hall of Fame inductee. He was one of the few players on the team that helped guide them to becoming a formidable force on the grid iron. He was named Most Valuable Player twice in his 14 year career. Bradshaw retired in 1984 and has worked as a game analyst for more than 20 years on various national television networks. The charming host is also an energetic speaker at motivational events and one of the famous spokespeople for Nutrisystem. Today in America TV is proud to provide the best in educational programming. The engaging show covers topics that reflect a nation of committed professionals and their home and work lives. The program reviews the best in America, hidden gem small schools of higher education and a diverse array of subjects on business, technology and health. It airs on regional and national business oriented cable networks. 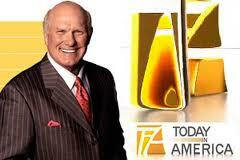 More information about the first-rate show, its host Terry Bradshaw and the broadcast schedule is available at todayinamericatv.com or on social media sites such as Facebook and YouTube.